Schedule a meeting of the board of directors to address the proposed change. The written bylaws for the corporation establish policies and procedures, including the internal procedure required to amend the articles of incorporation. Enact voting at the meeting that results in approval to amend the articles. An individual may vote in person or by proxy. Voting by proxy authorizes one person to vote another’s shares. 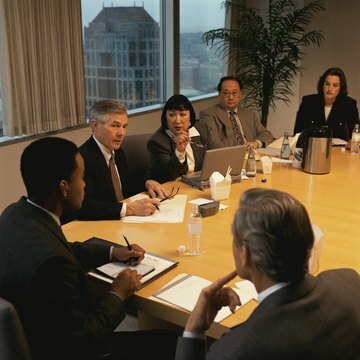 The bylaws generally establish what constitutes a quorum, or the number of shareholders or board members whose votes are required for changes to be enacted. The bylaws may state which changes may be enacted by the board alone, which may require a super-majority of the board or a majority vote of the shareholders. Prepare the amendment to the articles of incorporation. Most secretary of state websites have blank forms that you can complete, which cover most types of changes. As long as an amendment complies with state requirements, a freehand version may be used. File the amendment with the secretary of state in the state where the business is formed, either by mail or in person. Generally, this is true for most states. Pay the filing fees, which generally vary from state to state. Attach the original amendment that has been filed and stamped to the original articles of incorporation. Original corporate documents, along with the corporate seal, are often kept in a book or file by the secretary or other authorized officer or director. A title company, attorney or other business professional may request verification of corporate existence, as well as other pertinent information contained within the articles and amendment. Requesting parties will usually accept file-stamped photocopies or certified copies of the documents in lieu of originals.